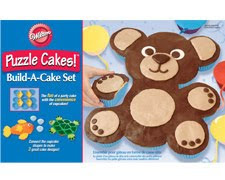 At the Fence: WILTON PUZZLE CAKES SET REVIEW AND GIVEAWAY! I like the monkey shaped pan. I want one of everthing at Wilton!!! I would love to have the Princess Carriage Pan for my daughters B-day. I emailed my friend TonyandRett. I LOVE the Candy Castle Cake decorating ideas! I wish we had this for my daughters' birthday! My friend Sarah emailed me about this giveaway! I love the Hexagon Treat Boxes. My husband and I will often times make cookies as treats for others and well these would make a great presentation instead of tinfoil. I would love to have that giante cupcake pan! I really thought that this cake was adorable!! I would love to have the lightning mcqueen cake pan. My son is totaly into CARS right now. His birthday is in August, and I just know he will want a CARS bithday party! This looks like so much fun! I would love to get some of their ultra gold cake pans. I love all of their different pans--it's too hard to choose just one! I really like the monkey shaped pan. I would like to own the 3 Tier Pillar Cake Stand. I would have to pick the princess one for my youngest as she is my total diva girl. I like the Cookie Master Plus Cordless Cookie Press. Thanks for the chance! I want all the cookie cutters! I like the 4 piece baby themed set! I like the 3D Choo-Choo Train Pan Set! I like the princess cake set. Wow, those Silly Critter Baking cups are ADORABLE!! I might have to buy them for my daughter - she loves animals!! I'm a new follower, thanks to Friday Follow! I love the cupcakes and more stands I would love to have one of the larger ones. 1. I am following this blog!! I like the Heart Cookie Treat Pan. I've never had a cookie press, but I bet the cookie pro ultra II cookie press would be a great way to get into it. I subscribed to this blog via e-mail. I love the dancing daisy pan! Their giant cupcake pan looks cool. I would also love to have their Mini Fluted Mold Pan! I like the Candy Castle Cake decorating ideas. i'd like the dinosaur cake pan. I have always been wanting the King size muffin pan. I like the 3D football pan. My son (and husband, lol) would both love football shaped birthday cakes! I like their Bear Silicone Baking Cups. I would like to have the 2010 Wilton Yearbook.